1 Free Aloe Gloe Organic Aloe Water (15.2 fl. oz., any variety) in Kroger stores, with coupon. This Kroger Free Friday Coupon is available for download on Friday, December 7, 2018 but you have until December 23, 2018 to redeem it. What is Aloe Gloe Organic Aloe Water? Aloe Gloe Organic Aloe Water is a healthy drink with Aloe Vera. Aloe Vera which contains more than 200 biologically active amino acids, vitamins, antioxidants, enzymes and minerals that have been clinically proven to improve skin and cardiovascular health. Ingredients: Water, certified organic aloe vera, gel inner leaf powder, certified organic cane sugar; certified Stevia; malic acid; natural flavors. 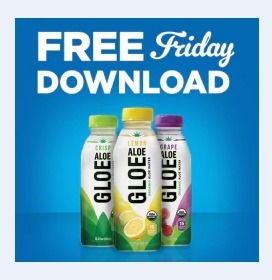 Redeem your coupon in-store within 2 weeks for 1 free Aloe Gloe Organic Aloe Water (15.2 fl. oz., any variety). Your coupon will automatically be applied at checkout when you use your Shopper’s Card. Available in most stores.